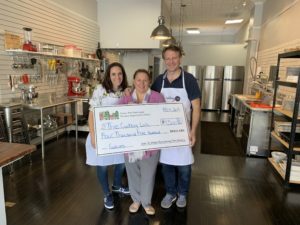 The Greater Port Washington Business Improvement District (BID) issued a $2,500 Facade Rehabilitation Grant and a $2,000 New Tenant Bonus Grant to The Cooking Lab which is located at 162 Main Street. The purpose of the Facade Rehabilitation Grant Program is to provide assistance to property owners and businesses within the district that are interested in the rehabilitation of their exterior building facades. The purpose of the New Tenant Bonus Program is to allow our organization to help start a business within the BID District.